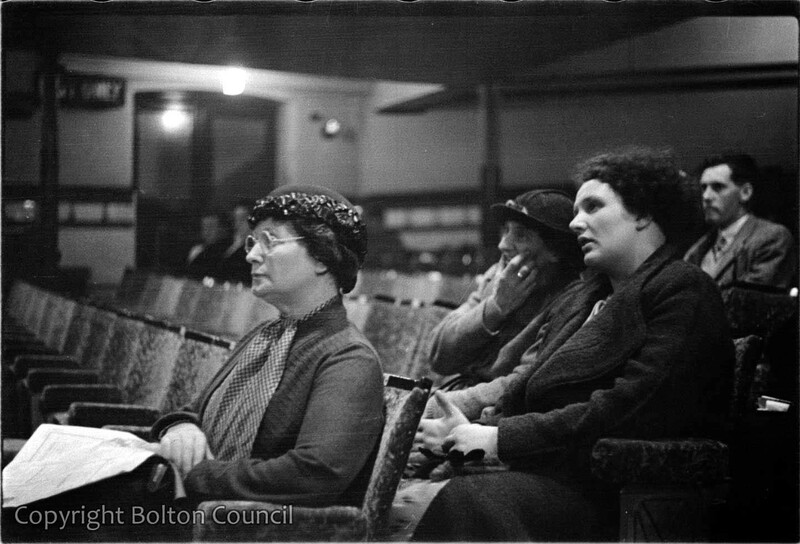 Audience for a performance of ‘Madame Butterfly by the Universal Grand Opera Company at the Grand Theatre, Bolton. The building has now been demolished. Humphrey Spender went to the matinee performance at 2.30pm on Wednesday 22nd September. His ticket and a written report are in the Mass Observation Archive with an account by fellow observer Brian Barefoot which was written as if was of a political meeting. Women kept hats and coats on. A few carried conversations on into introductory music to acts. Two women in front talking about a very bad accident – (young man lost an arm an injured the other terribly but is pulling himself together well). Poor playing by orchestra. Singing quite good but no idea of acting. Scenery suitably Japanese, ex-aggerated. Slit-eyed make up and European idea of tiny steps taken by Japanese women. Coiffure as in Japanese prints. Emphasis on WHITE characters (see plot) obtained by men in white ducks (semi-naval & uniform) and Lews European wife in white cotton dress (pre-war slinky), parasol, white cotton stockings, broad brimmed red hat, white high heeled shoes, hideous horse-like face. Big limbs uncontrolled. Comments heard were confined to remarks on the sweet, quiet behaviour of child (aged about 3-4). No comments heard about music.